A simple meal at home can be tastier and more romantic than an expensive restaurant. 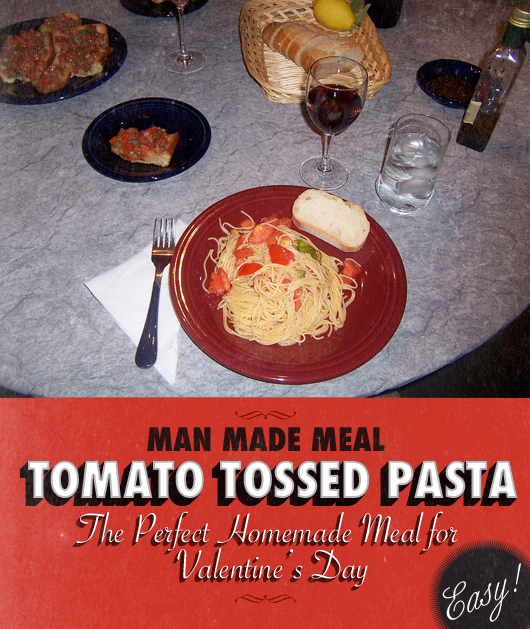 With Valentines Day coming up (ahem) we Recession proof your plans with this easy homemade meal that won't hamper the romance. It has been suggested that cooking a meal for the lovely lady in your life is a good idea. It’s actually a fantastic idea that will impress her, make you look awesome, and add an exciting and necessary skill to your repertoire. In fact, there is nothing bad to be said about cooking, except for one thing; you really aren’t on the level of Guy Fieri or Alton Brown. No worries, my friend, we here at Primer have got you covered. Before I delve too deeply into the actual recipe, let’s examine this as what it is: an event. An event that should appear as though a lot of thought and preparation went into it. It should appear that way, because you will put a lot of thought and preparation into it. First, make sure you have a decent place setting for two. If you don’t, try the IKEA 365+ set, a cheap, attractive, and durable option. Furthermore, since you are attempting to present a gourmet Italian meal, go the extra mile and pick up a few pieces that will add to your table setting. 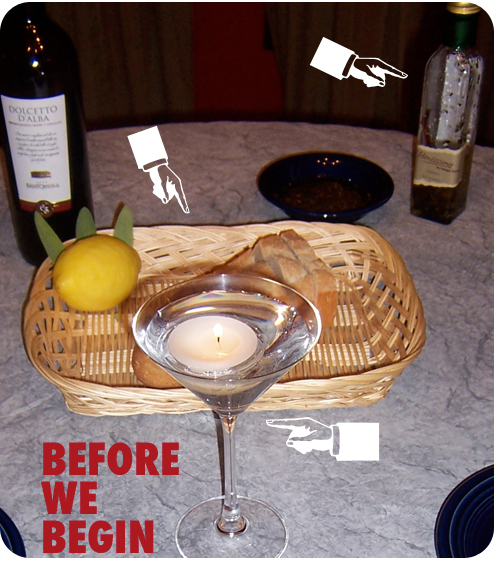 A breadbasket and an olive oil bottle with a pourer go a long way in classing up your dining room (or kitchen) table. And while we’re on the subject of classing up the table, try tossing unscented tea light candles into wine glasses to give your table a sophisticated (and inexpensive) glow. Let’s get to the meal itself. In an effort to recreate the experience you would get at a snazzy Italian restaurant, we’ll start with bread on the table. You’ll need to pick up a nice, thick loaf of Italian bread. Chop it in half, set one half aside for your appetizer, slice the other half into four pieces, and pop them into the basket. Set out a small dish with dipping oil (I recommend this stuff from Hongar Farms) and you’re set. With the other half of the bread, slice it in half as though you were going to use it for a sandwich. Drizzle each half with Extra Virgin Olive Oil (EVOO), put it on a pan in the oven oil side down and let it toast for a few minutes at 475° until it’s a nice golden-brown. Be sure to keep an eye on it so you don’t burn it. Once it’s finished, rub it down with a clove of garlic, drizzle a little more EVOO on top, and then top it with the bruschetta. Do all of your chopping, and then mix the tomatoes, garlic, basil, and EVOO in a bowl. Add salt and pepper to taste if you like. Let sit overnight in the fridge. This lets all of the ingredients become good friends and blend well. Simple right? You’re halfway done with your food prep a day ahead of time. 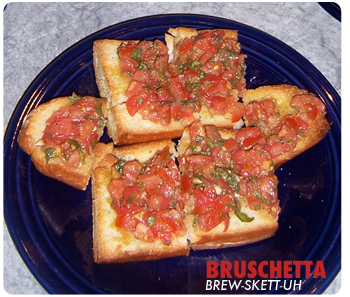 As for the main course, you’ll be preparing a very similar dish to the bruschetta. I call it Tomato Tossed Pasta. EVOO – I eyeballed it, but I'm estimating anywhere between 1/2 and 3/4 of a cup will do the job. Italian seasonings – This could be oregano, rosemary, parsley, garlic powder, etc. Put the water on to boil the pasta. Pour the EVOO into a bowl, medium-dice the tomatoes, and drop them into the bowl. Add liberal amounts of Italian seasoning. Toss. Add more oil and seasoning as needed. Add the fresh basil. Toss some more. Leave the tomato/oil stuff at room temp while the pasta cooks. After you pour the pasta into a strainer, dump the tomatoes and friends into the hot pot. 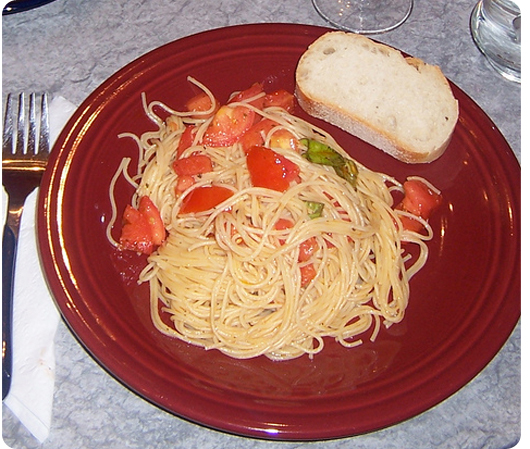 Pour the pasta back in with the tomatoes and proceed to, once again, get your toss on. The final piece to this culinary puzzle is the wine. Pick out a decent white wine to accompany the light, Mediterranean flavors of the main course and appetizer. 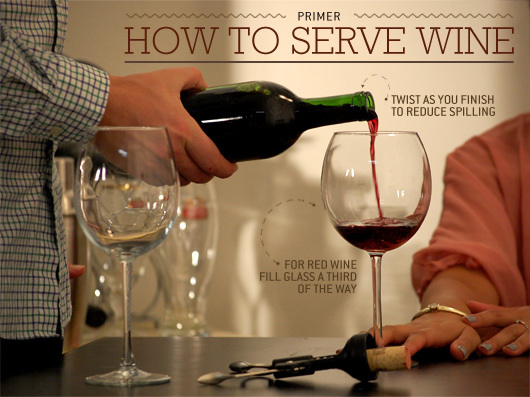 Keep the bottle in the fridge until about fifteen minutes before the meal. At that point take it out and let it sit at room temperature until you’re ready to serve. If you prefer reds, a simple Italian table wine should go well with the bruschetta. For a red wine, leave it at room temperature until about ten minutes before serving and then pop it in the fridge to get a slight chill. Preparing and presenting this meal to your significant other will earn you some serious brownie points. With the right set up, meal, and music you’re guaranteed to have a night to remember. Leave your comments here and tell everyone how well it went. If you liked this, look for the next installment of the Man Made Meal focused on preparing the perfect Mexican Fiesta. I would just like to add that I have found making the bruschetta 2-3 hours before the meal is much better than the day prior. Is that how you pronounce bruschetta? I’ve always pronounced it as brew-SKETT-tah! @Patrick: Great, great tip. I can’t stand stale bruschetta myself.